Previously we published Multimeter Guide for Dummies, which was for the new users with illustration which have few thousand Pinterest Repins. In that guide we talked about buying a cheapest possible multimeter for DIY electronic works. We talked about Multimeters as general topic in another article. Digital Multimeter Vs Analogue Multimeter comparison arises whenever we want to buy a costly, sensitive multimeter for long term usage. We can view the topic in different way – why we need a $200+ multimeter (does not matter whether it is Digital Multimeter or Analogue Multimeter) when a $2 Made in China Digital Multimeter does the job? Correct and more than 50% of the hobbyist never need a costly multimeter. If you are new user, we suggest to read our those linked article and buy a cheap digital multimeter to get used with the tool. This guide is really for those who demands an upgrade for some reason. Analogue Multimeter means Analog Multimeter. Analogue and Analog spelling may confuse a new user but means the same. These two types of multimeters have their own advantages and disadvantages. You may ask is there any cross-over or hybrid of digital and analogue? Actually there are such, they are known as Hybrid Dual Display Multimeter. Number of such devices with truly separate digital and analogue function, particularly of good build within one housing is rare. Analogue multimeter can use different basic technologies. Analog multimeters are useful where the trend of a measurement is more important than an exact value obtained at a particular moment. Analog multimeters are still preferred by many engineers because analog multimeters are more sensitive to changes in the circuit that is being measured. A digital multimeter samples the quantity being measured and then displays it but, the analog multimeters continuously read the test value. So if there is slight change in reading, the needle of an analog multimeter will track them but a digital multimeter may miss them. This continuous tracking becomes important when testing capacitors or coils. Resistance measurements by analog multimeter is of low precision. Analogue Multimeters usually has sensitivity of ±0.5%. Also they are fragile. In short – possibly today, most do not need an Analogue Multimeter. Bench-top multimeters needed for accuracy better than ±0.01%. Digital Multimeters are quite sensitive, indeed overall more sensitive, more easy to use. You can buy an entry grade Analogue Multimeter for fun together with a Digital Multimeter. Digital has an inherited “not so good” feel compared to Analogue. But case of Multimeter is different. Digital Multimeter overall are good for day to day work. 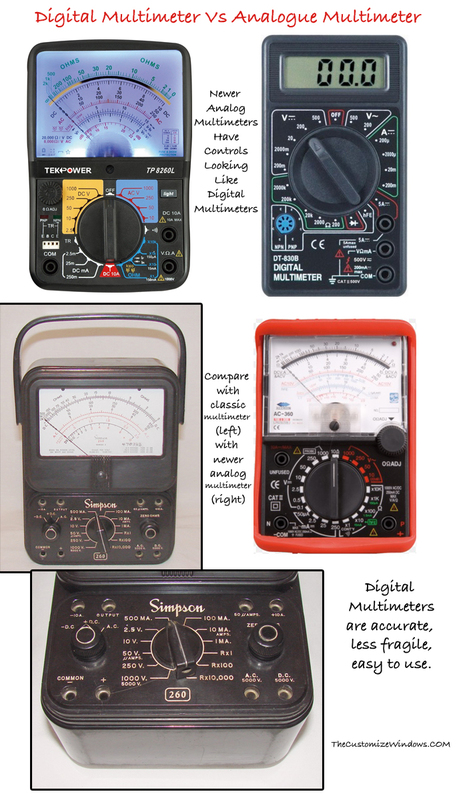 Newer Analogue Multimeters are designed to give the knob looking like Digital Multimeters. This Article Has Been Shared 5165 Times! Peoples Often Ask How to Program a Micrrocontroller or IC. In This Article We Have Explained Which Microcontrollers Can Be Programmed and Their Proper Naming Convention. Here is How to Build DIY Ultrasound Machine Under 500 Bucks. Small Companies Easily Follow the IEEE Medical Device Standard For Production. Here is How to Create DIY Custom Design Glowing Symbol For Car Windshield With 12 V Electroluminescent Panel or LED Electroluminescent Wire. Cite this article as: Abhishek Ghosh, "Digital Multimeter Vs Analogue Multimeter," in The Customize Windows, February 1, 2017, April 21, 2019, https://thecustomizewindows.com/2017/02/digital-multimeter-vs-analogue-multimeter/.